Working in tandem with technologies like BLE, voice assistance platforms are maturing. Together, they may be able to solve old problems across numerous verticals. Earlier this year, we saw one very creative use of voice technology. One hacker at Bosch’s IoT Hackathon used Bluetooth beacons and an Amazon Echo to set up a proximity-based, voice-enabled game designed to keep utility costs down. But that’s only the beginning. In the future, we can expect to see voice and beacon-enabled solutions everywhere including clothing stores, office, and even your living room. Commercial voice assistance platforms, also known as virtual personal assistants (VPAs), have really taken off recently. 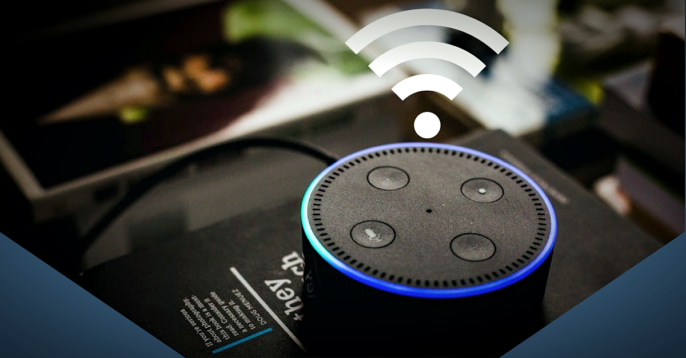 While today, the buzz may outweigh the actual impact of the technology, Gartner found that 35% of respondents to a 2017 survey said they used voice assistance platforms, a 3% increase from the previous year. Voice assistance platforms, like Apple’s Siri, were first widely available in mobile phones. In their early days, VPAs mostly focused on performing simple “hands-free” tasks, like looking up the address of a restaurant or changing the song on your playlist. In the past few years, voice assistants have begun integrating themselves in our homes, and Gartner predicts that worldwide end-user spending on VPA smart speakers will reach $3.52 billion by 2021. Currently, voice assistants can feel like over-attentive yet incompetent waiters. They are always hovering, asking if you need anything, but they often completely misunderstand your request. But as machine learning improves these platforms, voice assistants are better able to understand not just what we what we say, but what we actually mean. The next logical step is being able to predict what we want and make appropriate suggestions. With help from third-party app developers, voice assistants are maturing and learning new “skills”. These skills are increasing allowing VPAs to interact with other technologies including Bluetooth low energy (BLE) beacons and tags. Studies have found that voice prompts can be very effective, as people make strong connections with their voice assistants. With that in mind, it seems clear that VPAs will increasingly assist us in tasks, from simplifying shopping to guiding workplace routines. Launched in 2011 in the iPhone 4S, Siri has since moved into Apple’s Homepod. But Siri now has a lot of competition including market-leader Alexa, the voice of Amazon’s Echo, as well as Microsoft’s Cortana and the Google Assistant in Google Home. As smart homes become more dynamic, Bluetooth beacons can increasingly come into play. Beyond interacting with white goods and appliances that are “born smart,” Bluetooth sensors can digitalize physical items and processes in our homes with help from smart speaker systems. Using beacons, you can create virtual perimeters which react when people enter or leave the defined area. The way we move through our homes can act as triggers for any number of actions, from turning off the lights to sending personalized, time-specific prompts. For example, your smart speaker could send you an encouraging message when you approach the exercise bike or remind the kids to bring their homework when approaching the front door in the morning. Configuring Bluetooth beacons with prompts can remove friction from completing little tasks, which will add up to big changes in our everyday lives. Developers like the team behind Alexa Shop Assist want to create virtual sales staff using voice assistant platforms. This could be especially useful in big box stores where beacons interacting with voice assistants could provide a GPS for shopping carts. In large retail stores, it can be difficult to find a staff member to answer your question, and when you do finally find someone, they may not have the answer you need. A voice assistant interacting with Bluetooth beacons could quickly guide customers to the product they need, answer follow-up questions, and even suggest upsales. While it is still early days for VPA-salespeople, developers like those behind Allrecipes’ Dinner Spinner are eager to explore the possibilities. When shopping for dinner, a person who wants to make chicken tikka masala could ask their VPA to find a recipe, guide them to the shelves where they can find the necessary ingredients, and even suggest items that are on sale. Beyond assisting customers, BLE technology is contributing to the automation of retail shops. The shining example of this is the flagship Amazon Go store, which opened in Seattle in early 2017, where customers can completely skip the checkout process. Shoppers can collect the items they need and simply walk out, payments are handled automatically by the app in the customer’s phone. While Amazon has not clarified what technologies are used to make Amazon Go work, it is a good guess that Bluetooth beacons are part of the mix. Considering Amazon’s purchase of American grocery chain Whole Foods in summer of 2017, it seems only a matter of time before Alexa starts working in brick and mortar locations and automated shopping solutions are rolled out by more retailers. Voice assistants have the possibility to create hands-free guidance in any number of workplace tasks. Such solutions are already in place in warehouses and distribution centers, where Bluetooth beacons and tags are also becoming increasingly common in the creation of indoor navigation systems. When a staff member receives a picking order, an in-ear voice assistant can verbally guide them to the items they need based on the information from smart shelves and BLE indoor navigation systems. In potentially dangerous settings, like underground mines, workers could receive verbal prompts from VPAs if they enter or leave beacon-defined perimeters. VPAs can also guide workers in performing tasks where specific protocols or step-by-step directions need to be followed. With the addition of AI to voice assistants, workers will be able to ask VPAs specific questions, like how and where to navigate heavy machinery in beacon-defined spaces. While some of this sounds like science fiction today, voice assistance platforms are gaining new skills and new intelligence every day. By interacting with the physical world with the help of BLE technologies, VPAs will increasingly become part of our lives. American writer and content consultant based in Stockholm. James' life mission is to make complex issues easy-to-understand, or die trying.